Dr. Paluvoi is very knowledgeable! Wait time was a little long but it’s allergy season so it’s expected. Would see himagain! Dr. Paluvoi's practice focuses on patients with allergic conditions such as nasal allergies, asthma, food allergies, eczema, insect sting allergies, acute and chronic hives, chronic sinus problems and immunological disorders. Dr. Paluvoi graduated from a reputed medical university in India and then trained in pediatric health care in Jamaica and received Diploma in Child Health from University of West Indies in Kingston, Jamaica. After emigrating to USA he completed pediatric residency and fellowship in pediatric and adult Allergy & Immunology from Howard University Hospital, Washington, DC. Dr. Paluvoi is board certified in pediatrics, Pediatric and Adult Allergy & Immunology. Dr. Paluvoi's special interests include allergic asthma, food allergies and immune deficiencies. Dr. Paluvoi gave guest lectures at local hospitals grand rounds and round table conferences in his specialty. He has written several articles in local health journals regarding allergies. Dr Paluvoi is a Fellow of American Academy of Pediatrics and a Fellow of American College of Allergy, Asthma & Immunology. He served as a CME Committee member of American College of Allergy, Asthma and Immunology. 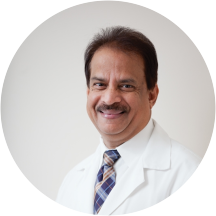 He is a member of local allergy societies and also a consultant for Loudoun Allergy Network. Dr. Paluvoi resides in Northern Virginia with his physician spouse and has two college going kids. I was happy with my appointment. The staff was friendly and personable. Great doctor! He took his time to talk to us about a treatment for my son. The office was very busy because its allergy season, but I didn't have a long wait. The staff are very friendly and treat us verywell. I highly recommend this office to anybody looking for a great allergist! Dr. Paluvoi was great. Very knowledgeable and very direct. I arrived for an allergy test and the nurse who handled the beginning of my consultation was fantastic. The only reason I gave this doctor a "Maybe" in "Would you recommend" isbecause his front office staff was incredibly rude. One of the front desk workers was very pregnant; I don't know if that contributed to her attitude that day but she was incredibly rude in the interaction I had with her. I handed her my license and insurance card while I took the paperwork to fill out. Once she was done copying my ID, she called out for me to come get the cards. I said, "Hold on a sec" as I was filling out paperwork. She called my name again and I said "Just a minute". She sighed loudly, threw my cards on the counter, sat down in her chair and rolled away to her computer. I found her shortness to be both off-putting and unprofessional. It seems I wasn't the only one, as she was very short with the family that arrived after me and sighed very loudly again once the small child in the waiting room started to cry. I know that everyone has bad days but it put me off. Dr. Paluvoi's office was very busy - we had about half an hour wait - but he treated me as if I was the only patient there. He spent as much time explaining and answering my questions as I wanted. Hisoffice was also very on top of receiving and confirming my ZocDoc appointment request. I waited a long time to see the doctor and i was not impressed with the receptionist or nurses. But I thought Dr. Paluvoi was great. I will deal with the reception/wait times to see him again. I recommend Dr. Paluvoi highly and often! Very happy with our visit. Glad we decided to come here. Dr. P. is GREAT with kids. He was friendly, upbeat, patient with my 5 and 1 year old boys. He was very attentive and respectful to me, even as I was wrangling my toddler in the office :). He and thenurse were very quick with administering and reading the skin scratch test. I will definitely be back to Dr. P.
I had a very positive experience with Dr. Paluvoi. In addition to being friendly and easygoing, he answered my questions honestly and directly. Recommended! Very knowledgeable and nice, everyone was really nice. The doctor took his time, didn't make me feel rushed at all. I highly recommend this office. Efficient handling of your paperwork, I was seen fairly quickly, unlike other facilities where you have to wait for 30/45 minutes to go in and sit for another 20 until the doctor is done with a bunch of other patients. Thisis a small office, not a huge waiting area filled with tons of people waiting. The doctor dedicated enough time to review my medical history, answer my questions and did it all in an calmed, un-rushed manner. Great doctor. Listened to all my concerns and explained everything I needed and wanted to know. Would definitely recommended him to anyone! An awesome doctor. Spent more time with me than any other doctor anywhere. Wonderful experience. He listened to my concerns and was understanding and then thoroughly explained what would happen as well as options for the future. Very helpful and listened to all concerns. The Dr. went above and beyond to investigate the other factors contributing to my poor health. I really appreciate how thorough he was. The nurse did ask me all the same questions that I filled out on my patient information form.Since I did not feel well, and had already taken the time to answer these questions, this was not pleasant. Unfortunately, this is not uncommon with nurses, however. Was very comfortable with the consultation. They were very professional a little over crowded but understandable because it seemed a lot of people had great relationship with the doctors to get treated again. I think Dr. Paluvoi dealt with my situation in a very professional manner and listened to me very well as I explained my symptoms. I would certainly refer him to friends. He took my concerns seriously and we are on our way to hopefully getting an answer. Dr. Paluvoi is one of the best doctors I have ever seen. He is very personable and was very thorough. Dr. Paluvoi is very specific in his prescriptions. He does not over medicate like other allergists.